I had originally planned to make a simpler supper of grilled salmon with hollandaise for my mother and sister when they came round for dinner, but half way home I remembered that the blender had a massive crack down the middle of it and was essentially unuseable. Certainly, it was not a good idea to pour hot butter and vinegar onto cracked glass while a blade whirled around inside. So, I decided to go for a bit of an experiment. I’d already picked up the salmon fillets, and I remembered thinking that the pesto crust I used for the cod the other week would be nice with salmon so I decided to have a play. The result was excellent – firm, succulent salmon offset with the creaminess of the pesto and the delicate saltiness of the parma ham. I served it on a bed of spinach and mushrooms with crushed new potatoes on the side. First, prepare the salmon. As with the Cod with Pesto Crust dish, mix the pesto, breadcrumbs and parmesan in a small bowl, but be a little more sparing with the application as you want it to cover four fillets of fish rather than two. I pressed about 2 teaspoons by hand onto each fillet. Then, on a clean chopping board, place two slices of parma ham, one very slightly overlapping the bottom of the other. This is where things can get a bit tricky: place the salmon, pesto side down, diagonally across the two slices of parma ham (taking care not to spill too much pesto) and gently but firmly wrap the salmon. Place each fillet on a baking tray lined with foil and cover with another sheet of foil. Preheat the oven to 180°C and put the new potatoes on to boil. Once the potatoes have come to the boil, place the salmon fillets in the oven and bake for 15 minutes. After 15 minutes, remove the foil and bake for a further 5 minutes. While the potatoes are boiling, slice the mushrooms and fry them gently in about a dessertspoon of olive oil. Just before the mushrooms start to leak liquid, add the minced garlic and turn down the heat. 5 minutes before the end, wilt the spinach into the mushrooms and garlic. Test the potatoes to make sure they’re cooked, drain and return to the pan. Add about 25g butter and allow it to melt slightly before crushing the potatoes with a fork. You want them to remain mostly whole, but to expose a little of the flesh inside. Season with pepper and shake the pan to distribute the butter evenly. 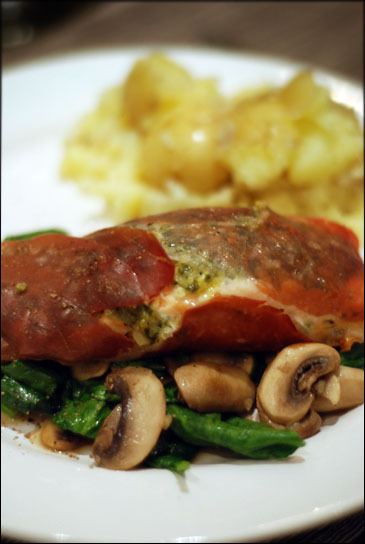 To serve, place two tablespoons of spinach and mushrooms on a plate, place a baked salmon fillet on top and some potato on the side. I found the dish was particularly good with a light, fruity red wine like Bourgogne or Beaujolais. And it was utter heaven!!! But you didn't blog the rhubarb tarts!!!!!!! shame on you! hurry up give us more!